Classic Gluten Free Pound Cake | Great gluten free recipes for every occasion. A traditional pound cake is so named because it’s made with a pound of flour, a pound of butter, a pound of sugar and a pound of eggs. Even so, most of the gluten free pound cake recipes I have shared with you have called for both butter and cream cheese. But there’s certainly something to be said for tradition. And this is precisely the sort of pound cake that is perfect for layering into a lovely warm-weather trifle with all sorts of colorful berries. I’ve said it before, and at the risk of making you cross with me I’ll say it again: gluten free baking requires gluten free recipes. So the traditional formula for a pound cake just doesn’t work perfectly for gluten free. This recipe in particular (unlike most recipes for pound cake) only makes 1 loaf, so it’s more like a half pound of this, a half pound of that as a starting point anyway. Feel free to double, though, if you’re looking for 2 loaves or you’d like to make the recipe in a bundt or tube pan (just watch the baking time). The batter is smooth and silky, and very thickly pourable. Once you add the eggs to the beaten butter and sugar mixture, it may look a bit curdled but it will smooth right back out when you add the flour mixture. As always in baking, the temperature of the ingredients very important. In a recipe this simple, it’s especially important. The butter and eggs must be at room temperature for everything to combine properly. If you add cold eggs to room temperature butter, the butter will clump. To bring cold eggs to room temperature, place them in a warm water bath and allow them to sit for about 15 minutes. Cold butter can be chopped and microwaved for 10 seconds, no longer. Be sure to stop before the butter melts. There’s nothing else quite like the smooth baked interior and slightly crispy, perfectly browned crust of a traditional pound cake. The crumb of a pound cake is tighter and the cake itself denser than vanilla cake, but not at all dry. It’s not too far off the 1:1:1:1 ratio of traditional “pound” cake, but the adjustments make it just as good made gluten free as it is made with gluten. We might have to get there a slightly different way, but we’ll get there. If they can make it with gluten, we can make it without. *I really like this recipe even better when it’s made with gluten free cake flour, which is a blend of 82% all purpose gluten free flour + 18% cornstarch. In this recipe, that would be 180 grams all purpose gluten free flour + 40 grams cornstarch. Preheat your oven to 325°F. Grease well a standard loaf pan (about 9-inches x 5-inches, or a bit smaller) and set it aside. 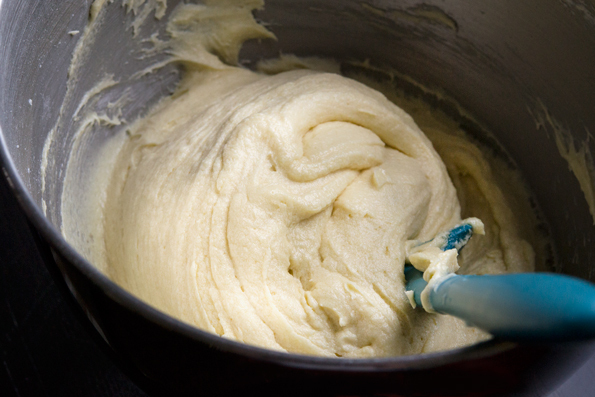 In the bowl of a stand mixer fitted with the paddle attachment or a large bowl with a handheld mixer, cream the butter on medium-high speed until it is light and fluffy. Add the sugar, and then the eggs (slowly, while the mixer is on low speed) and vanilla, beating after each addition until well-combined. Turn the mixer speed up to medium-high, and beat until smooth. In a small bowl, place the flour blend, xanthan gum and salt, and whisk to combine well. Add the flour mixture, about ¼ cup at a time, to the mixer bowl with the wet ingredients, and mix until just combined. The batter will be thick but soft and smooth. Scrape the mixture into the prepared loaf pan, and smooth the top with a wet spatula. Carefully bang the bottom of the pan a few times on the counter to release any air bubbles. Place the loaf pan in the center of the preheated oven and bake, rotating once during baking, until lightly golden brown all over and a toothpick inserted in the center comes out clean (about 50 minutes). Remove from the oven and place the cake, still in the pan, on a wire rack to cool for at least 30 minutes before removing from the pan and allowing to cool completely. This recipe was originally published on the blog in 2013. The photos have been updated to showcase the true beauty of this gluten free pound cake, and the recipe has been modified just a bit. I baked this cake today. Something went terribly wrong. First I don’t understand the recipe. How much flour do you use? 1 Cup 9 Tbls. Are you telling me 2 Cups of flour or explaining how many tbls make a cup. I wasted alot of money on this cake. Very disappointed. Betty, there are 16 tablespoons in a cup. The “1 cup 9 tablespoons” is one cup of flour (16 tablespoons) + 9 more tablespoons flour. That is 7 tablespoons less than 2 cups of flour. You will always have the most success baking when you bake by weight, which is why I provide the total weight of flour as 220 grams. Can you add lemon to this and make a lemon pound cake…my favorite? I don’t see why not, louetta! Thanks so much for the hard work and dedication, it is greatly appreciated. I gave the gluten-free pound cake a try. I used your recipe for the all-purpose flour. I am also trying to drastically cut down/eliminate refined sugar so I substituted granulated sugar with coconut palm sugar (1.25 cup for the required 1cup). It changed the color . . . a little browner, but the pound cake was great. And I didn’t feel guilty about having it. I am the mother of two Autistic sons, and years ago we tried to go gluten-free. It was EXTREMELY difficult, and costly. There was so much resistance that we were not able to continue. I made the pound cake but didn’t mention to the boys that it was (gasp) gluten-free. They started eating it before it had a chance to cool. That pound cake did not see the light of another day. . . . they are ready for me to make another. I truly appreciate the time and effort you take to test and refine these recipes. Next challenge will be the Japanese Cheesecake. Hello, I’ve just made this cake, and followed the recipe 100 %, but it’s come out quite dense and very heavy. Does it really not need some sort of raising agent, like baking soda or baking powder? I’m sorry this pound cake recipe didn’t turn out for you. I know how frustrating that can be. However, it’s one of the best-tested recipes I have, as I have made it well over a dozen times. A pound cake gets its rise from the eggs, not from any sort of chemical leavener like baking soda or baking powder. Pound cake is not a fluffy, vanilla cake, it is more dense by design. However, if yours was overly dense, I’d always look first to the flour blend you are using as they are not all created equal. Then, be sure you are measuring by weight, and using an oven thermometer to check your oven’s temperature as most ovens are improperly calibrated. I made a Tandy cake with this recipe. I used a jelly roll pan. A nice layer of peanut butter and chocolate on top. It came out awesome!! : ) thanks a million!! Thank you, thank you! My son is Autistic and almost 15. We are venturing into gluten free foods for our whole family! Of course cutting out traditional gluten foods, bagels, breads, etc., is a struggle for my son and my husband! But I made this last night and didn’t tell anyone it was GF…they were all wanting more! Mostly my son and husband!!!! Couldn’t have been happier! Great directions for simple fools proof results! Thanks & can’t wait to try more! Just to confirm – recipe calls for 1 cup + 9 tablespoons of flour? Thank you! The recipe is correct as written, Regina! Does it matter which GF All Purpose Flour you use? Is it a personal preference as to which GF All Purpose Flour people use? Hi, can I replace sugar using stevia ? And how many grams does it need? I would try a nonsugar replacement like Swerve, Shamin, that is meant to be a 1:1 sub for granulated sugar. But you’ll have to experiment! I haven’t tried it with this recipe (yet) but I’ve discovered that the Truvia baking blend works perfectly in most GF recipes, just use 1/2 the amount by volume. Unlike Swerve it does have real sugar in it so if you have to avoid sugar altogether it’s not for you, but the amount of sugar is very low and unlike Swerve it doesn’t seem to have that not-sugar aftertaste you get with a lot of sweeteners. 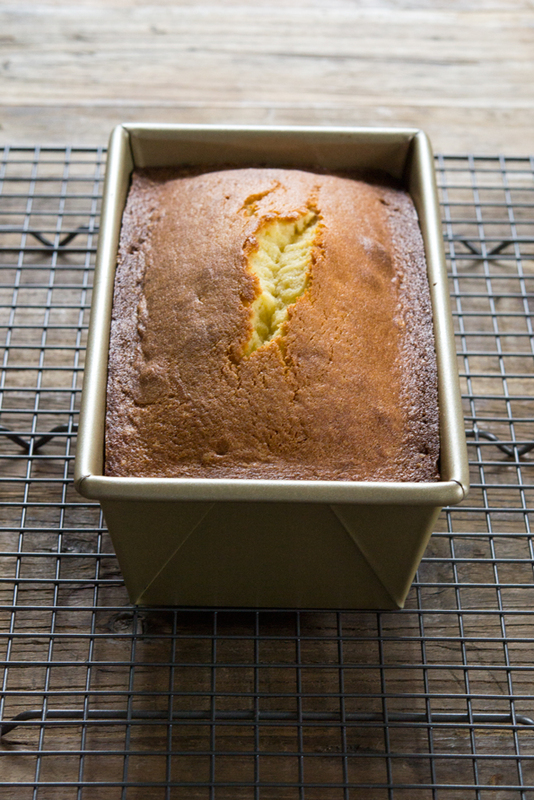 I love me some pound cake – and it’s silly though I don’t think I’ve ever made it. Probably because I’d be the only one eating it. not cool. but 1/2 the battle is knowing that it’s here when I need it. love that!! thanks for all you do! By any chance, have you made this recipe without egg? Either using flax our a commercial egg replacer? you should try it out and report back to us all – however, this might not be a true pound cake without eggs, kwim? good luck! Hi, Sarah, as I mentioned below to Kristie, I really don’t recommend that. You’re better off with a yellow cake. Sorry! I figured, but I thought I would try! Boy do I miss pound cake! doubtful but try it out and report back – this recipe has A LOT of eggs. Maybe try Nicole’s vanilla cake recipe instead? it’s awesome. I’m afraid I really, really don’t recommend that. If a recipe has more than 2 eggs, which this does, egg replacers really don’t work. Sorry, Kristie! Super hot already, Mena? Oh no! yeah very hot and humid especially because we don’t have AC. today is horribly hot and humid. no baking going on today! I am a recent convert to your blog and recipes, and in fact made my Celiac (diagnosed just 7 months ago) daughter her favorite banana pudding with your vanilla wafers out of your Quick and Easy cookbook today. That’s one thing she’s been asking for and I almost made it with Kinnickkinnick graham crackers but I’m so glad I found your book and recipe. It was delicious! Now if you’ll just develop a CHOCOLATE pound cake recipe after this standard one, you’ll be my hero, too. My daughter doesn’t have a huge sweet tooth so that part of GF has been fairly easy, but she has always loved chocolate pound cake and banana puding. I’ll keep hoping you get to that soon! Your recipes are the best! There’s a recipe for Gluten Free Chocolate Cinnamon Pound Cake here on the blog, Linda! It’s a copycat of the Starbucks one. I hope that fits the bill! Do I HAVE to wait? whiiining! Love you Nicole!!!! Your photos look good enough to eat! I found this place after a friend recommended you instead of Gluten-Free girl, who refuses to make any substitutions for eggs or dairy. And I need that! Nicole, I’m so glad I’ve found your site, as I’ve been turned off by another long-time gluten-free blogger and her issues. Your recipes look lovely. Can the recipe be doubled and baked in a 10 inch tube pan? So excited to see this recipe! I discovered your blog just recently and I’m so glad I did! I put your books on my Christmas list and I’ve got some Japanese Milk Bread in my oven right now! You do such a great job with your blog and it really shows your talent and dedication. Thanks for sharing your talented self and repertoire of recipes. I love pound cake, definitely pinning this! I was in the supermarket for certified GF oats this morning and a cashier lamented on how horrible it was that I had to be GF. I said “Oh, no! I have Nicole Hunn from Gluten Free on a Shoestring–I am not missing out on anything!” I love pound cake!!!! I think this might have to be made for T-day, along with the normal pies. This looks sooo good, and I’m always looking for recipes without milk or cream or cheese. Butter seems fine with me, thank goodness! I can’t wait to try this. Thank you for all you do for those of us who deal with food restrictions. I just bought your “Quick and Easy” book and am looking forward to digging into it. Yum. I love pound cake so much – and I love that you put the almond extract version because that just makes me swoon. love it! but I just made the pumpkin butter so it’s pumpkin all the way for me for a while…. say, how long with the pumpkin butter last in the fridge and can I freeze it? Hi, Jennifer! I have successfully stored the pumpkin butter in the refrigerator for 1 1/2 weeks. As with most foods, though, I’d go by smell. If it doesn’t smell right, it’s spoiled. There’s enough sugar, though, to preserve it in the refrig for quite a bit! Same here with the almond extract! LOVE the flavor that adds. Fabulous thank you I am going to try this today for Erin! Linnea will love this! Pound cake, strawberries and whipped cream every year for her birthday, but I’ll make the cake soon, just for practice. Yum. I have done a lot of searching for great GF recipes and websites online, but quite honestly, I have found that your blog and cookbooks are all I need. They are excellent! Thank you for all you do! I share this feeling and I tell everyone that asks me about gluten free. This blog and the books are the only thing you need to be 100% successful! In your recipes, when you say in the ingredient list, “gluten-free flour”, you are referring to a GF blend like Better Batter? Just wanted to make sure as I am new here. Thanks. I am loving your site!!! Yes – that is what she is saying and if you do use a blend with xanthan gum, then you leave it out. If you use a blend without the XG, then you put it in.